At Impact Trophies & Medals, we offer a huge range of Crystal Galleries trophies, gift sets and awards suited to any event or competition. 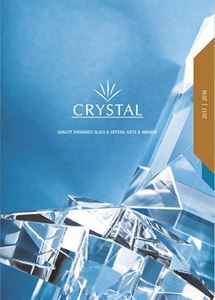 Our extensive range includes crystal trophies, engraved desktop accessories and crystal wall plaques for businesses. Impact Trophies & Medals are a leading retailer of crystal trophies & awards. Great for personalisation, many of our crystal sports trophies and engraved glasses can be personalised with high quality text and logo engraving, to perfectly meet all your club or business presentation needs. The Round Hot Shot Tot Glass is a simple but stylish shot glass with a deep crystal base and short, straight sides. The Round Hot Shot Tot Glass is small glass with optional personalisation, allowing you to perfectly mark any event or special occasion. The Round Hot Shot Tot Glass is supplied in a free skillet box but can be presented in a satin lined gift box to create an extra special gift. 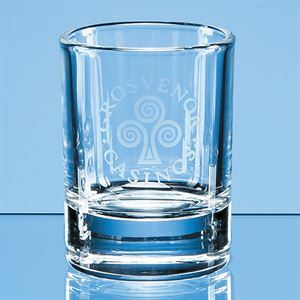 The Round Hot Shot Tot Glass can be purchased with or without personalised high quality engraving. Made from a quality grade of glass, the Tall Heavy Base Shot Glass is a slim, straight sided glass with a capacity of 60ml, perfect for holding a double measure. Finished with a deep base providing a premium feel, the shot glass can be engraved with a personalised inscription of your choice and comes in a free skillet box. A satin lined presentation box can be purchased to add an extra special touch. 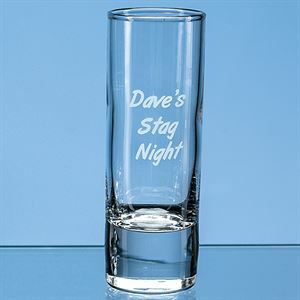 The Tall Heavy Base Shot Glass can be purchased with or without personalised high quality engraving. Made from high quality clear crystal glass, the Conical Shot Glass is a small shot glass with conical sides and a deep circular base. Small but the perfect gift to mark any occasion, the Conical Shot Glass can be engraved with personalised text and logo engraving, to perfectly mark any event or celebration. The Conical Shot Glass is supplied in a free skillet box with option to purchase a satin lined presentation box. 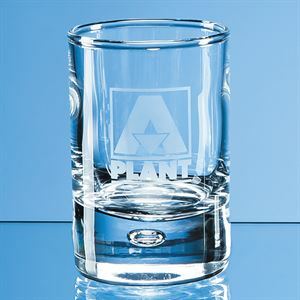 The Conical Shot Glass can be purchased with or without personalised high quality engraving. A traditional glass with a modern twist, the Strauss Square Tot Glass is a superior quality crystal glass with a square based design. Set on a deep base, the Strauss Square Tot Glass has short rectangular sides and curved edges for a smooth finish. Perfect for displaying personalised engraving, the Strauss Square Tot Glass can be engraved for any event, occasion or venue. 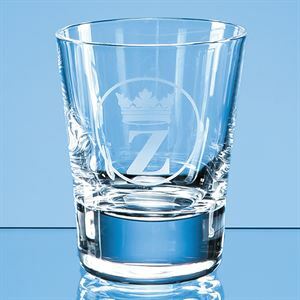 The Strauss Square Tot Glass can be purchased with or without personalised high quality engraving. The Slanted Tot Glass is a quirky take on the traditional. This circular crystal glass stands on a typical circular deep base, with slanted circular walls, of a slightly off piste finish. Perfect as a display piece or in use. The 50ml Slanted Tot Glass can be engraved with personalised text and logo engraving, to perfectly match branding or mark a special occasion. The Slanted Tot Glass is supplied in a free skillet box, a satin lined presentation box can be purchased to create a luxurious gift. 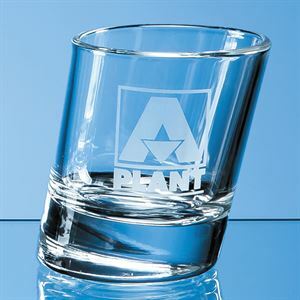 The Slanted Tot Glass can be purchased with or without personalised high quality engraving. The Bubble Base Tot Glass is a superb quality crystal glass tot glass. This stunning small shot style glass stands on a deep base with straight sides, perfectly mimicking the style of a small whisky tumbler. Detailed with a large bubble in the centre of the base, the Bubble Base Tot Glass can be personalised with high quality text and logo engraving. A satin lined presentation box is available, making the Bubble Base Tot Glass a brilliant gift for a special occasion. 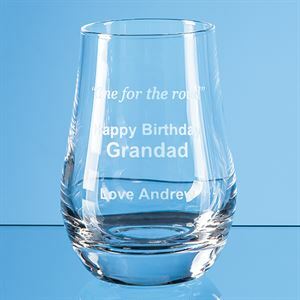 The Bubble Base Tot Glass can be purchased with or without personalised high quality engraving. The Infinity Shot Glass is a high quality shot glass set on a deep base, with a curvaceous body. 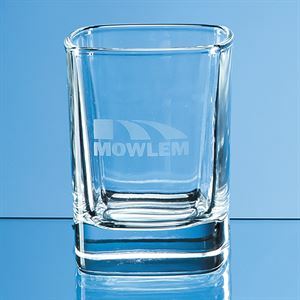 Sophisticated and a step away from a traditional shot glass, this fantastic glass would be the perfect container for a premium spirit or event. The Infinity Shot Glass can be personalised with your choice of high quality engraving, marking any occasion, event or venue perfectly and can be supplied in a satin lined presentation box. The Infinity Shot Glass can be purchased with or without personalised high quality engraving. Small but perfectly formed, the Tall Bubble Base Shot Glass is a tall slim shot glass with a very deep bubble decorated crystal base. Perfect for a single shot of up to 30ml, this small glass is perfectly designed for purpose. Available with the addition of high quality text and logo engraving, these glasses would be perfect as a gift or as part of a larger glass collection and is supplied in a free skillet box with option to upgrade to a satin lined presentation box. The Tall Bubble Base Shot Glass can be purchased with or without personalised high quality engraving. 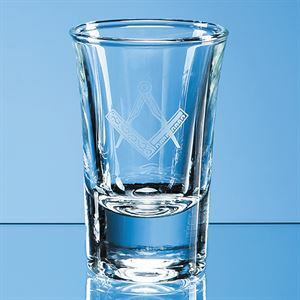 The Big Shot Tot Glass is a large 60ml shot glass with a traditional conical design. Set on a deep crystal base, the Big Shot Tot Glass is the perfect glass for those who like a larger or flaming tipple, and can be engraved to mark any venue, celebration or event with high quality glass engraving. The glass comes in a standard skillet box, although a satin lined presentation box can be purchased in addition to create a perfect gift. 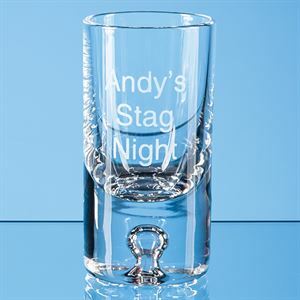 The Big Shot Tot Glass can be purchased with or without personalised high quality engraving. 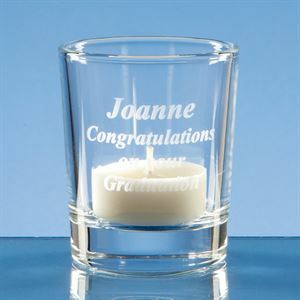 The Round Tealight Holder can be purchased with or without personalised high quality engraving. The Straight Sided Beer Glass 0.58ltr is a premium solid based beer glass with a conical shape and straight sides. 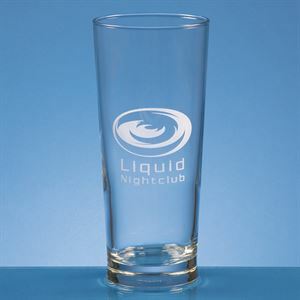 This premium quality beer glass has a large engraving area, perfect for displaying your choice of text and logo engraving. The Straight Sided Beer Glass 0.58ltr will hold just over 1 pint and can be used for brand awareness or as a personalised gift. The Straight Sided Beer Glass 0.58ltr can be purchased with or without personalised high quality engraving. Deep and made from the finest jade glass, this square faced paperweight is perfect for use at home or in the workplace. 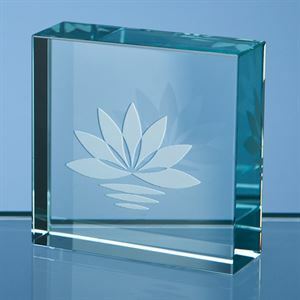 Perfect for keeping your paperwork in order, this simple and sleek crystal paperweight can be engraved to display your choice of branded or personalised engraving, making this the perfect gift for corporate or personal use. The Jade Glass Square Paperweight is supplied in a free presentation box. The Jade Glass Square Paperweight can be purchased with or without personalised high quality engraving.